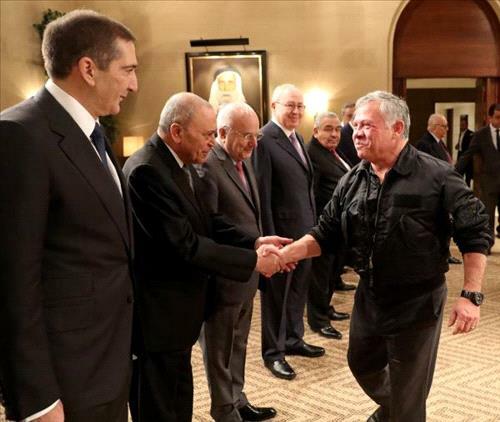 AMMONNEWS - His Majesty King Abdullah met on Monday with former prime ministers at Al Husseiniya Palace and discussed a number of domestic issues and regional developments. Former prime ministers Zeid Rifai, Ahmad Obeidat, Taher Masri, Abdul Salam Majali, Abdel Karim Kabariti, Fayez Tarawneh, Abdur-Rau'f Rawabdeh, Ali Abu Al Ragheb, Adnan Badran, Marouf Bakhit, Samir Rifai, Awn Khasawneh, and Abdullah Ensour attended the meeting. King Abdullah affirmed that political reform is not merely a slogan, stressing that there is a genuine will to develop political life in the Kingdom and pointing to his vision on this as outlined in the Royal Discussion Papers. His Majesty said developing political life requires the cooperation of all, especially the political elite, noting that the goal of his recent meetings with parliamentary blocs and civil society institutions is to encourage them to present proposals and identify political, economic, and social priorities for the coming years. The King stressed that everyone is a partner in achieving progress in the nation’s interest, and all have the responsibility to deal with the current conditions and challenges facing Jordan, affirming the important role of former prime ministers in this regard. Turning to economic conditions, His Majesty noted the importance of moving forward in economic reform for Jordan to become self-reliant. The King highlighted the upcoming London Initiative Conference, slated for 28 February, as an important step to support Jordan’s economy and to affirm that the Kingdom is on the right economic track. His Majesty affirmed that there is zero tolerance for corruption, underscoring that abuse of public office is unacceptable regardless of the level of the employee. Commenting on regional conditions, the King reiterated Jordan’s steadfast position on the Palestinian cause despite pressure, stressing the Kingdom’s full support for the Palestinians as they seek their legitimate rights to an independent state on their national soil with East Jerusalem as its capital. The meeting also covered developments in Syria, with His Majesty noting the need to reach a political solution to the crisis that safeguards Syria’s territorial integrity and the unity of its people while ensuring the safe return of refugees. Moreover, the discussion touched on the King’s recent visits to Iraq, Turkey, and Tunisia, which were aimed at bolstering cooperation with these countries, especially at the economic level. Speaking at the meeting, the former prime ministers stressed the importance of debating various issues inclusively to come up with solutions to political, economic, and social challenges. They called for supporting small- and medium-sized enterprises to reduce poverty and unemployment. Discussions also covered the importance of maintaining the state’s authority and symbolism. The former prime ministers commended His Majesty’s regional and international efforts to safeguard Jordan’s higher strategic interests while seeking security and stability in the region.